Poised between soil and sky, forest canopies represent a critical point of exchange between the atmosphere and the earth, yet until recently, they remained a largely unexplored frontier. For a long time, problems with access and the lack of tools and methods suitable for monitoring these complex bioscapes made canopy analysis extremely difficult. Fortunately, canopy research has advanced dramatically in recent decades. Methods in Forest Canopy Research is a comprehensive overview of these developments for explorers of this astonishing environment. The authors describe methods for reaching the canopy and the best ways to measure how the canopy, atmosphere, and forest floor interact. They address how to replicate experiments in challenging environments and lay the groundwork for creating standardized measurements in the canopy—essential tools for understanding our changing world. Margaret D. Lowman is Director of the Nature Research Center at the North Carolina Museum of Natural Sciences and Research Professor at North Carolina State University. Timothy Schowalter is Professor and Department Head in the Department of Entomology at Louisiana State University Agricultural Center. Jerry F. Franklin is Professor of Ecosystem Analysis in the College of Forest Resources at the University of Washington. 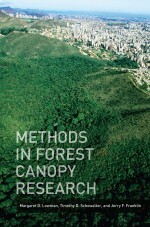 Methods in Forest Canopy Research (cover photo).